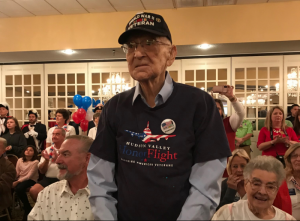 The Community Service Council of West Pasco held its 12th Honor Flight at Home on Saturday, January 12th in New Port Richey, Florida. The Watermark at Trinity escorted one of our fine U.S. Veterans, Otto Tatar who was recognized as an Honor Flight Ambassador. The program included wonderful patriotic music, Taps, a Salute to the Branches by the Palm Tree Santa’s Drill Team, as well as an Honor Flight Virtual Tour. Mayor Rob Marlow was present for a Proclamation Reading as well as guest speaker Retired Chief Master Sergeant O’Neil Ducharme, United States Marine Corps. At the conclusion, the Veterans were given a spectacular “Welcome Home” with lots of cheers & support from home.